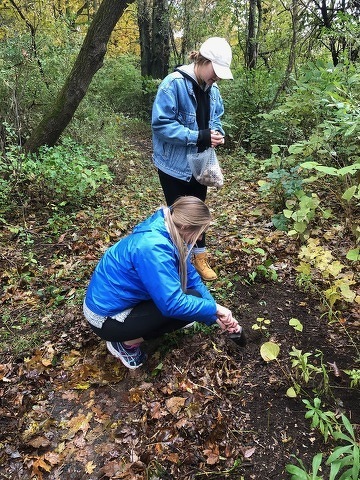 Zeta Tau Alpha members Isabela Guerrero, standing, and Taylor Pellman plant bulbs along a trail at the Penn State Blue Course as part of the Happy Valley Flowers project. On a damp and chilly Sunday afternoon, a group of Penn State students got together to do a little gardening. Armed with troughs, shovels, rakes and more than 500 crocus and daffodil bulbs, approximately 20 members of Zeta Tau Alpha sorority and interns from the SURGE Business Development company braved cold and muddy conditions Oct. 28 to plant the bulbs along a walking path on the perimeter of the Penn State Blue Course. They’ll have to wait a few months to see the fruits of their labor, when the flowers will bloom in time to be enjoyed by the many local runners and walkers who use the path in the spring. Shannon Gearhart, a Penn State senior, is an intern at SURGE and the project leader for this community effort, known as Happy Valley Flowers. “The goal is really just to try to beautify State College and to make it a prettier place,” Gearhart said. It’s also an opportunity for sorority members to work toward some of their community service requirements. This is not the first time that SURGE interns have combined efforts with Penn State organizations to plant flowers in public spaces. The project began in 2015, when interns teamed up with a fraternity to plant bulbs along the golf course and at several local parks. In 2016, they expanded the effort to include members of the community at large. With permission from Penn State golf courses, on one end of the Blue Course walking path that runs parallel to West College Avenue, interns installed a wooden box containing bulbs, troughs and planting instructions for anyone walking the path who might like to plant a few bulbs along the way. They placed another box at the other end of the trail as a place to collect the troughs. The organization took a hiatus in 2017 before bringing the project back this fall under Gearhart’s direction. The project does not end with the Oct. 28 planting event, Gearhart said. Gearhart hopes to see the project expand in the future. 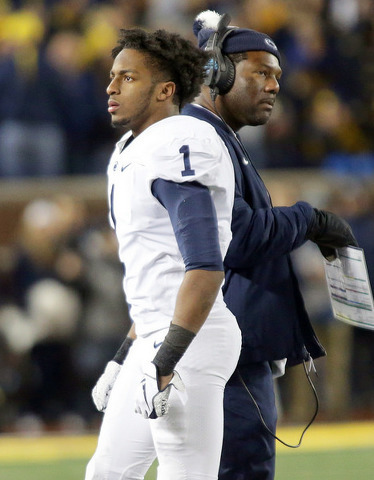 Penn State football appears to have lost its mojo. Especially on offense, and along the sidelines. A drive I took to Latrobe this summer helps explain why. It was the end of July, and I headed west out of State College to spend the day at the Pittsburgh Steelers’ training camp.